A quartet of innovative students at NYU have given plants a way to call you when they need watering. 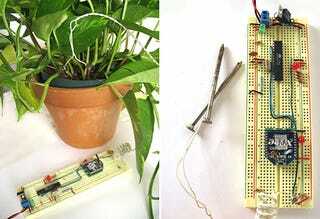 Using moisture sensors attached to the plants, when a plant needs watering an clever chain of software is triggered, sending data to an open-source telephony application called Asterisk. Asterisk makes a call to a designated number, playing back an audio file in the "voice of the plant," describing what it needs. If you want to find more about each one of these plants, and maybe even hear them talking to you, there's a phone number you can call: 212 202-8348. We tried to call the plants, but apparently they had just stepped out. No word yet if the plants are complaining about how you never give them bottled water, or how you never call or write.